Herschend consults with other like-minded companies that are interested in bringing Lead with Love principles into their businesses. The Leading with Love Conference is a professional development event that teaches the fundamentals of a corporate culture that has driven the success of Herschend since 1950. Corporate leaders will learn how to create a Lead with Love culture that can engage employees and create value for all stakeholders. The stories in this book are examples of our Herschend team choosing to Lead with Love. Some are funny, some are inspiring, and some are heartbreaking, but all can help us imagine new ways to bring families closer together, Creating Memories Worth Repeating®. 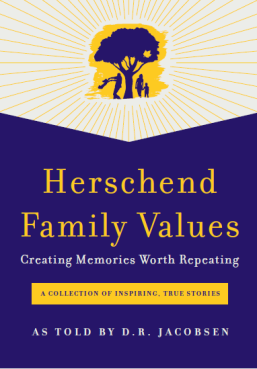 Herschend Family Values: Creating Memories Worth Repeating® is available for purchase at any of our Herschend Family Entertainment properties or by contacting books@herschendenterprises.com. Interested in being included in Volume 2? Click here for more information on how you can submit your personal story of Leading with Love.